It’s fall and it’s football season and a few of the boys in our neighborhood have a fantasy league. They hear about fantasy football everywhere, but these leagues can be a tad complicated and all-consuming for the little guys. Our league is composed of boys ages 12 to 15, plus three dads, and one mom (me!). We welcome girls too; we just haven’t found any yet. 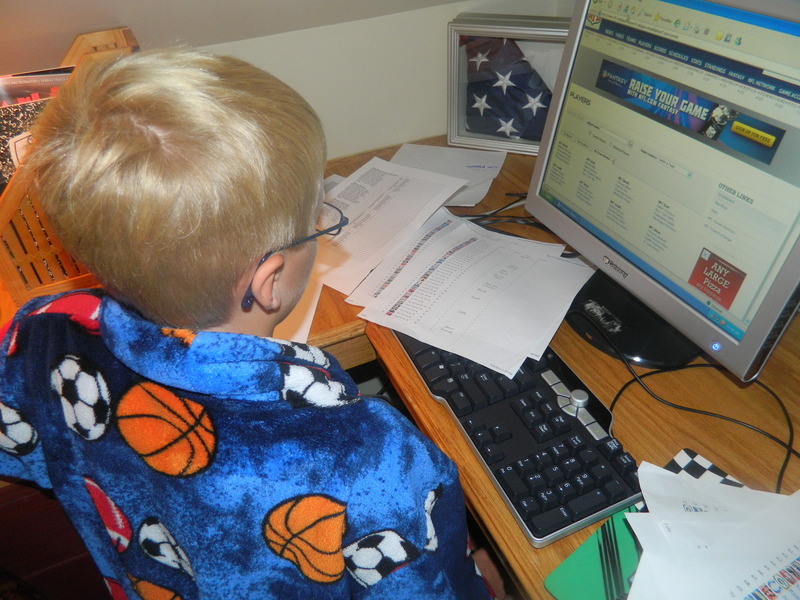 Early in the morning, before anyone else is up, the commissioner is working on the Burywood Boyz Fantasy Football Draft. The draft happens on Labor Day, two days after the final NFL team rosters are released, and three days before the first NFL game. It’s also the last day before school starts when we know the kids won’t have any homework. Our draft, paired with Labor Day, signifies the official last day of summer. 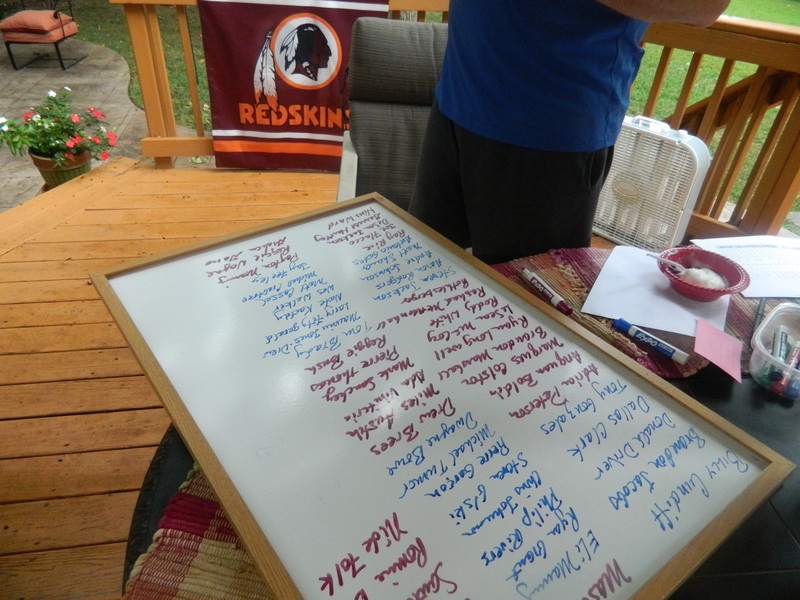 The draft picks are displayed on a white board. Each week during the regular football season, the teams submit to the commissioner their six-man roster which includes: one quarterback, one running back, two wide receivers (or tight end), one kicker, and one team defense. At the end of the football week (after Monday Night Football) the scores are tallied and whoever has the most points wins the week. At the end of the season, we have a playoff. What’s in it for the Boys? Fathers spending time with their sons on something they are both interested in. Being a “coach” and researching players to draft. Doing meaningful work by studying the stats each week in the sports section and deciding who plays the following week. Learning how to manage an Excel spreadsheet. Practicing math skills with scoring and stats. I get to throw the party! Of course the food is secondary, but what would a football draft be without stadium food? And, since it is the last hoorah of summer, it could possibly be the last official picnic of the year. So the entire family attends the draft. Desserts: food the kids can pick up and eat easily while they are drafting players. For today, Pale Summer Cookies. Live it up; it’s the last hurrah of summer. Keep it simple. It’s the day before school starts and you don’t need a lot of clean up. Use sturdy plastic and paper ware. Bring out all the football dishes you have. If you have time, get some team napkins. Decorate or not. Main thing: the food should be good and everyone should have fun. I play because they needed an eighth team so the teams could be paired for an end-of season playoff game. The name of my team? “Reed’s Rowdy Gurlz” named for Washington Redskins Safety Reed Doughty — the Kelley’s favorite player on our favorite team. Yes, Reed’s wife, Katie, knows about the name. She grinned (or grimaced, I couldn’t tell) when I told her. Guess who won the Burywood Boyz Fantasy Football League playoffs last year? Who else? — Reed’s Rowdy Gurlz! Just because I’m throwing a party doesn’t mean I can’t draft a playoff contender team! Mix well. Spray a pretty baking dish with oil, bake at 350 degrees for about 20 minutes. 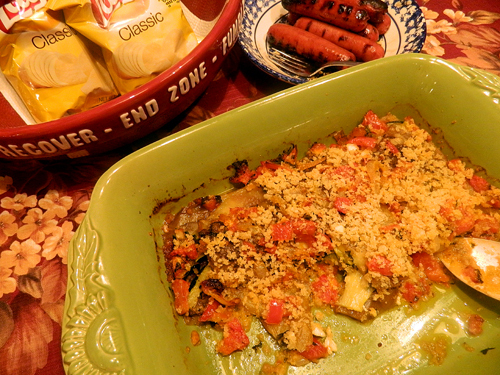 Serve hot with crackers. This also freezes nicely if you want to make it ahead. TIP: The trick to a good burger is to use meat with a liberal amount of fat in it (like an 80-20 mix. Season it with some good spices and mince some onion in the meat (the kids will never know the onion is in there that way). The trick to grilling is to be patient. Don’t over-flip, in fact, flip only once when one side is done, and don’t flatten with the spatula and release the juices. Keep the grill lid open or the grease drippings could cause a fire. Preheat oven to 350. Peel and thinly slice peaches into a two-qt. 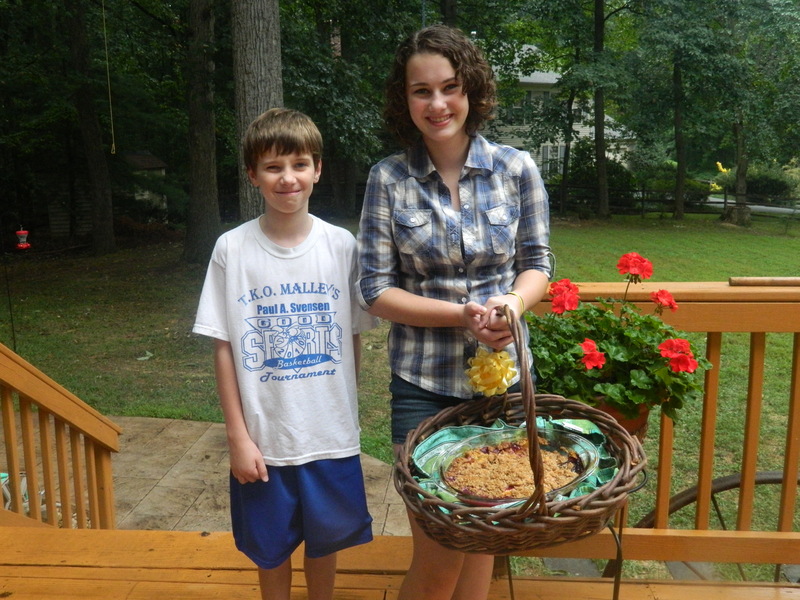 baking dish. Add blueberries; mix gently. Sprinkle 2. T. flour and 2 T. sugar over fruit and mix gently. Sprinkle vanilla or almond extract over the top. Prepare topping: combine the oats, brown sugar, flour, cinnamon, and nutmeg. Cut in the butter until mixture looks like coarse crumbs. You can either do this with two knives, or with a food processor. 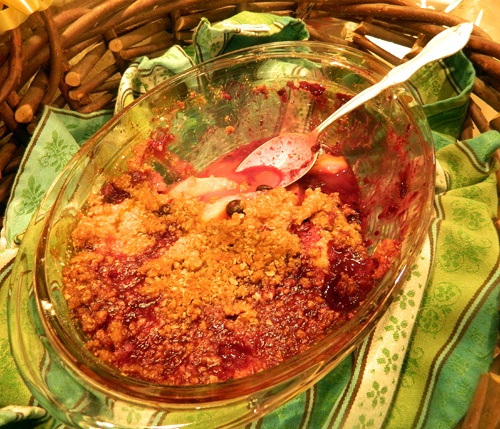 Sprinkle the crumb mixture over the fruit. Bake at 350 for 40 to 45 minutes, until the topping is browned and crispy. Let cool somewhat before serving. Best served warm with vanilla ice cream or lightly sweetened whipped cream. 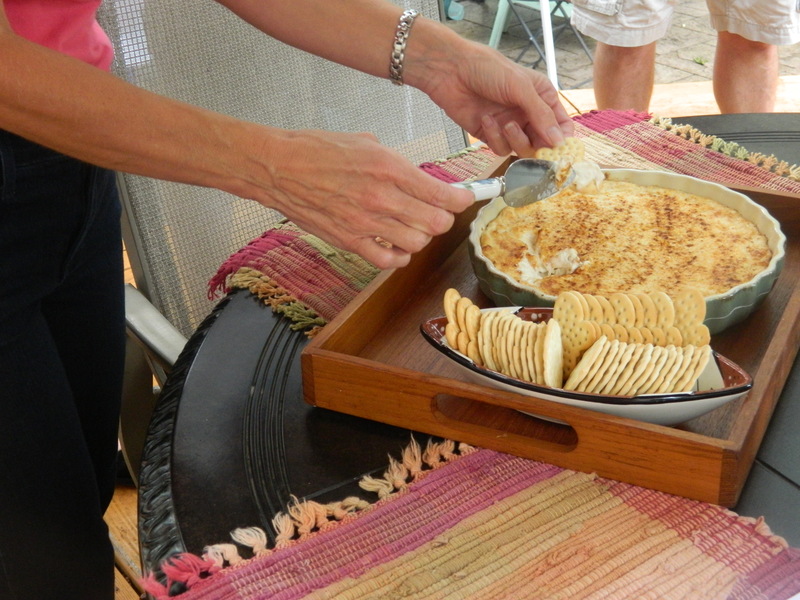 Of course, you could make this with all peaches, or use any other fruit such as nectarines, apples, other berries, etc. Personalize it, baby! 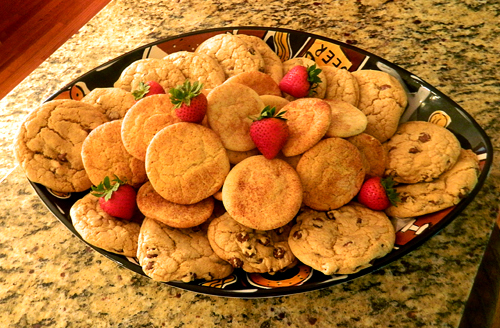 My Pale Summer Cookies get around...this time on a football platter.